Graphite and diamond have the same composition but completely different properties. Graphite: Graphite crystals in a piece of marble from the Saint-Jovite Skarn Zone, Mont-Tremblant, Les Laurentides RCM, Quebec, Canada. This specimen is approximately three inches (7.6 cm) in length. Graphite is a naturally-occurring form of crystalline carbon. 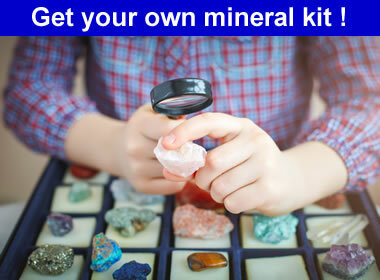 It is a native element mineral found in metamorphic and igneous rocks. Graphite is a mineral of extremes. It is extremely soft, cleaves with very light pressure, and has a very low specific gravity. In contrast, it is extremely resistant to heat and nearly inert in contact with almost any other material. These extreme properties give it a wide range of uses in metallurgy and manufacturing. Flake graphite: Flake graphite produced in Madagascar. Graphite chunk: Lump graphite from Kropfmuhl, Austria. Specimen is about one and one half inches (3.8 cm) across. Graphite with garnet: A specimen of graphite-mica schist with two red almandine / pyrope garnets from the Red Embers Mine, Erving, Massachusetts. This specimen is about two inches (5.08 cm) across. Graphite is a mineral that forms when carbon is subjected to heat and pressure in Earth's crust and in the upper mantle. Pressures in the range of 75,000 pounds per square inch and temperatures in the range of 750 degrees Celsius are needed to produce graphite. These correspond to the granulite metamorphic facies. Most of the graphite seen at Earth's surface today was formed at convergent plate boundaries where organic-rich shales and limestones were subjected to the heat and pressure of regional metamorphism. 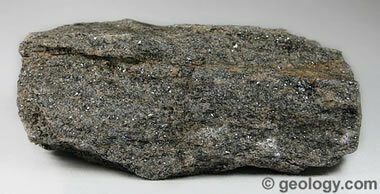 This produces marble, schist, and gneiss that contain tiny crystals and flakes of graphite. 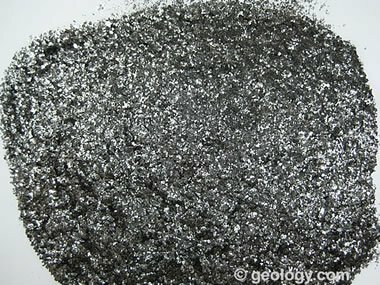 When graphite is in high enough concentrations, these rocks can be mined, crushed to a particle size that liberates the graphite flakes, and processed by specific gravity separation or froth flotation to remove the low-density graphite. The product produced is known as "flake graphite." Some graphite forms from the metamorphism of coal seams. The organic material in coal is composed mainly of carbon, oxygen, hydrogen, nitrogen, and sulfur. The heat of metamorphism destroys the organic molecules of coal, volatilizing the oxygen, hydrogen, nitrogen, and sulfur. What remains is a nearly pure carbon material that crystallizes into mineral graphite. 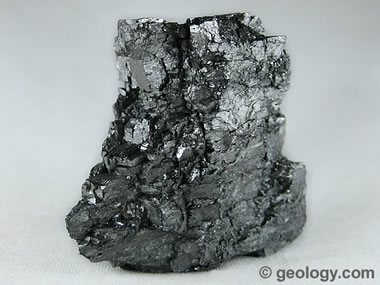 This graphite occurs in "seams" that correspond to the original layer of coal. When mined, the material is known as "amorphous graphite." The word "amorphous" is actually incorrect in this usage, as it does have a crystalline structure. From the mine, this material has an appearance similar to lumps of coal without the bright and dull banding. A small amount of graphite forms by the reaction of carbon compounds in the rock during hydrothermal metamorphism. This carbon can be mobilized and deposited in veins in association with hydrothermal minerals. Because it is precipitated, it has a high degree of crystallinity, and that makes it a preferred material for many electrical uses. 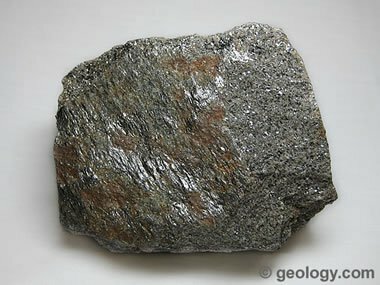 Small amounts of graphite are known to occur as a primary mineral in igneous rocks. It is known as tiny particles in basalt flows and syenite. 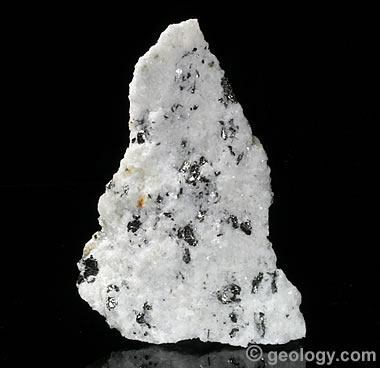 It is also known to form in pegmatite. 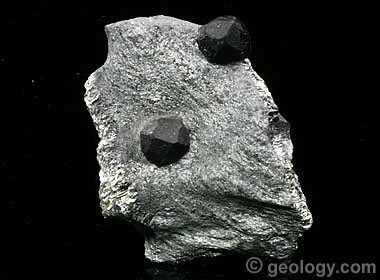 Some iron meteorites contain small amounts of graphite. These forms of graphite are occurrences without economic importance. Uses Used to manufacture heat and chemical resistant containers and other objects. Battery anodes. A dry lubricant. The "lead" in pencils. Graphite and diamond are the two mineral forms of carbon. Diamond forms in the mantle under extreme heat and pressure. Most graphite found near Earth's surface was formed within the crust at lower temperatures and pressures. Graphite and diamond share the same composition but have very different structures. Related: How Does Diamond Form? The carbon atoms in graphite are linked in a hexagonal network which forms sheets that are one atom thick. These sheets are poorly connected and easily cleave or slide over one another if subjected to a small amount of force. This gives graphite its very low hardness, its perfect cleavage, and its slippery feel. In contrast, the carbon atoms in diamond are linked into a frameworks structure. Every carbon atom is linked into a three-dimensional network with four other carbon atoms with strong covalent bonds. This arrangement holds the atoms firmly in place and makes diamond an exceptionally hard material. Graphite consumption: United States graphite consumption by use during 2012. Data from the USGS Mineral Commodity Summary. "Synthetic graphite" is made by heating high-carbon materials like petroleum coke and coal-tar pitch to temperatures in the range of 2500 to 3000 degrees Celsius. At these high temperatures, all volatile materials and many metals in the feedstock are destroyed or driven off. The graphite that remains links into a sheet-like crystalline structure. Synthetic graphite can have a purity of over 99% carbon, and it is used in manufactured products where an extremely pure material is required. Graphite in schist from Essex County, New York. Specimen is approximately 5 inches (12.7 centimeters) across. Graphite: unattributed article on the Asbury Carbons website. Natural Flake Graphite: unattributed article on the Asbury Carbons website. Graphite (Natural): Donald W. Olson, Mineral Commodity Summary, United States Geological Survey, 2014. Graphite: Donald W. Olson, 2012 Minerals Yearbook. United States Geological Survey, 2013.